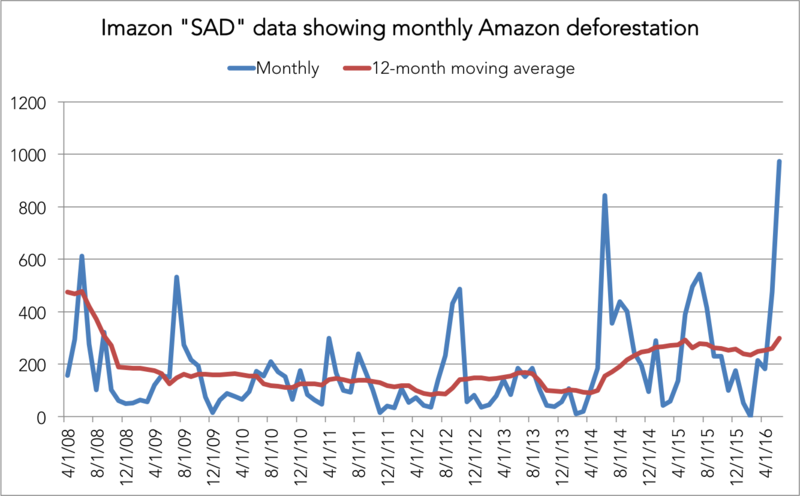 Preliminary data suggests deforestation in the Brazilian Amazon may be on the rise after years of remaining at historic lows. According to data released last week by Imazon, a group that tracks forest trends in Brazil, deforestation across the Brazilian Amazon amounted to 972 square kilometers or 240,000 acres during the month of June, the highest level recorded in a single month since November 2007 when 1,067 square kilometers were cleared. Relative to June 2015, forest destruction nearly doubled. Forest degradation — which typically precedes outright deforestation — also rose sharply. The Brazilian government has not confirmed the increase in forest loss. Brazil’s national satellite agency INPE, which provides official deforestation data, stopped monthly deforestation reporting last year. INPE now reports monthly data quarterly, making it more difficult to discern short-term trends in rainforest cover. Nonetheless the increase in forest loss would be consistent with historical trends. Forest clearing in Brazil often rises in dry years and when the national currency is weak, making agricultural exports more profitable. Both conditions are currently present in Brazil. Just two weeks ago, NASA warned that the Amazon is facing its driest early dry season conditions since 2002, raising the risk of catastrophic forest fires. Meanwhile the Brazilian real remains historically against the dollar, providing a boon for soy and cattle producers whose costs are denominated in reals and export revenues are in dollars. Environmentalists have also warned about broader political developments, including the 2012 weakening of the country’s forest code and a recent push by Congress to further reduce protections for forests. Brazil’s political and economic crisis has raised fears that conservation efforts may fall off the domestic agenda. 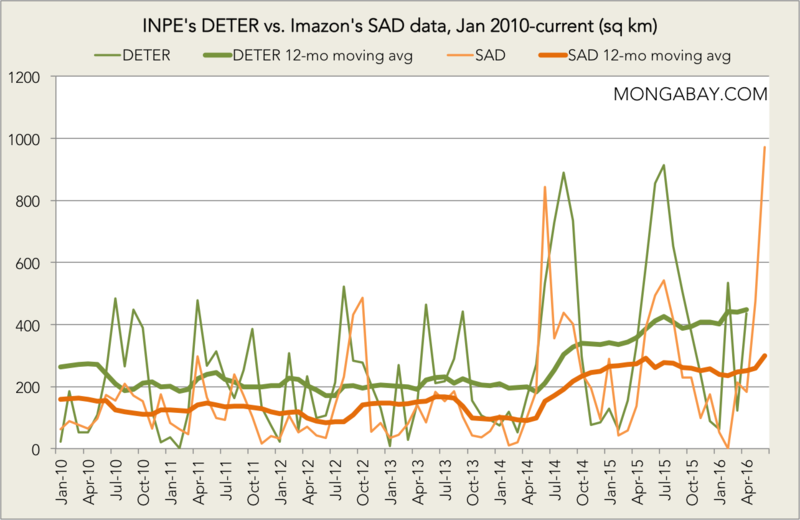 Monthly deforestation figures in Brazil can vary wildly, but both INPE’s and Imazon’s data show a steady rise in monthly forest loss since mid-2014, giving more credence to worries that Brazil’s progress in reducing deforestation in the Amazon rainforest may be waning. Stronger confirmation will come with data that should be released by both INPE and Imazon next month.